The meat and global warming link just got a huge publicity boost. Mark Bittman, author of Food Matters, vegan until 6, and food columnist/blogger at the NY Times, tonight appeared on what many consider to be the mother of all political talk shows (if you exclude the Daily Show) – the Colbert Report (1.3 million viewers)!!! Bittman begins by explaining what it means to “eat consciously” and how we could help ourselves and the planet by adopting a more plant-based diet. He then explains the meat and global warming connection with help from Colbert! Bittman was able to both talk about this subject seriously and play along to Colbert’s jabs. It was especially awesome to see Colbert read the statistics himself. Those of us that have been talking about meat and global warming can now say “It was on the Colbert Report”. Enough said! Colbert: And my guest tonight is NY Times Food Columnist Mark Bittman! I’ll ask him what foods taste best grilled over a burning NY Times! Colbert: You say that you are a vegan until 6 pm. But after that anything goes? Seriously? Does that just go for food? Colbert: You say that feeding a family of four – a steak dinner, is the equivalent of driving around in a SUV for three hours with all the lights on. Colbert: How does oil or fuel go into me having a steak? 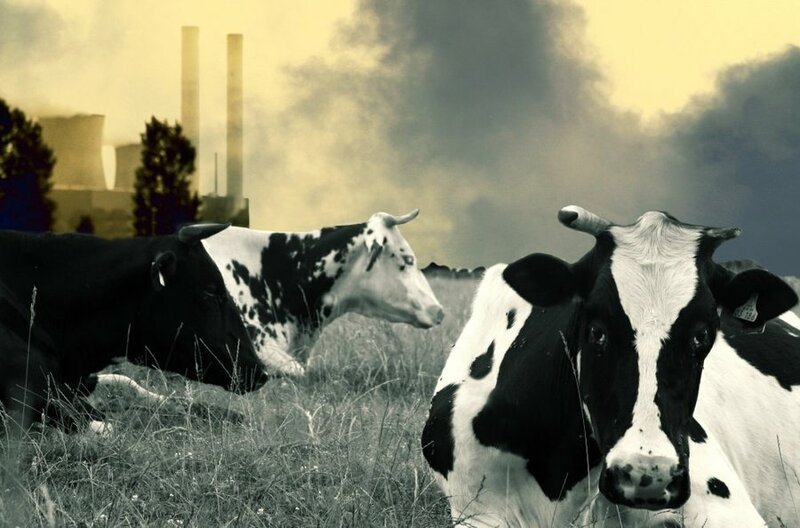 Bittman: It’s been said, by the United Nations that about a 1/5 or 1/6 of all greenhouse gases are produced by industrialized livestock production. Colbert: Industrialized livestock? Oh robot cows. Bittman: We churn out 10 billion (livestock) a year in this country which means about 30 animals per person in the United States. We eat those, it increases global warming. To the extent you eat less of that meat you reduce global warming. Colbert: You say if we ate 3 fewer cheeseburgers a week, it would have the same impact as taking all SUVs off the road. Bittman: If we reduce the amount of meat and processed food in our diets, we’re losing weight, we’re making ourselves less susceptible to lifestyle disease, and we’re actually helping the environment and reducing global warming. It’s like, almost everything. Colbert: If I could only eat one thing what would it be? Bittman: Uh…I dunno (Bittman hesitates…Colbert begins to end show) …cheeseburgers! One of the only blogs dedicated entirely to the environmental, health and global warming impact of meat. A professional documentary from the Netherlands all about meat and global warming, which premiered in May 2008. I haven’t seen it yet, but looks like people are reacting favorably! Check out some clips from the documentary on YouTube on the impact of lowering meat consumption to 1, 2, 3, 4, 5, 6, or 7 days of the week. This is a facebook group that currently has 4,600+ members. There are some interesting discussions/debates, and links/pictures/videos shared with other members. An inspiration for me to setup this blog and a great way to network. In January of this year, they launched a nationwide Public Service Announcement on the impact of meat on global warming. If you’ve been wondering why nobody has setup a professional looking website on this subject, this is your answer. Nice looking and up-to-date website/blog that “promotes food choices that are sustainable, ethical and environmentally responsible”. What that headline doesn’t tell you, is that they also emphasize the environmental / global warming impact of animal agriculture. Also check out their resources section, which includes videos, reports (they have 55), and a list of organizations. Their website is made for a young audience, and includes videos, vegetarian tips, a petition, a widget for calculating one’s footprint, and blog that details the PETA2’s efforts to get the word out that “Meat’s Not Green”. There is no other place on the web that is as dedicated to providing relevant links and especially VIDEOS on this subject. Even more impressively, they have a video section of politicians and top climate scientists (including Dr. James Hansen and IPCC Chief Rajendra Pachouri) sharing their thoughts on meat and global warming. There are many articles on what Dr. Pachouri said, but not many people learned that he gave an entire lecture on this subject, which included a follow-up from a discussion panel. Woot! CIWF also has written reports on the impact of meat and factory farms on the environment and global warming. He’s no Al Gore, but in the world of climate change, this guy is the man. I couldn’t decide which deserved the #1 spot, so I settled on my own blog … bwahahaha. I know I’m only one person, and there are many organizations that have done a lot more work on this than I have. But where else can you find a blogger on this subject with a snarky personality who writes top 10 lists on meat and global warming? For your information and amusement, I provided a Guilt Trip Rating for each video (GTR, 10 is high, 1 is low). In my opinion, videos with a low GTR are great for introducing this subject to someone. Videos with a higher GTR should be viewed with caution. Enjoy. ABC’s Dan Harris narrates this well-made video made for a mainstream audience that helps us to visualize how the beef production process releases greenhouse gases. The second part (Step 2) of the video encourages viewers to also get an energy audit. Point made: there’s more than one way to stop global warming, eating less beef is a lot easier. Bravo. 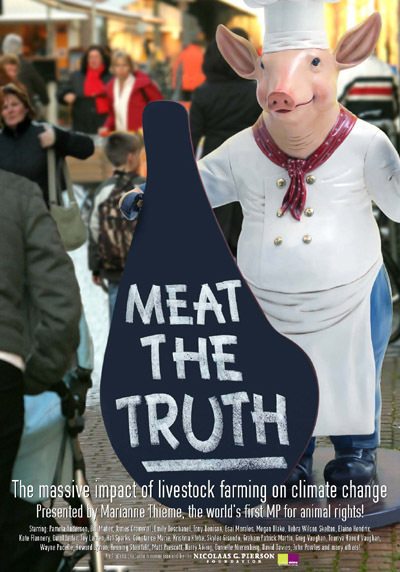 This is the trailer to a DOCUMENTARY on meat and global warming made in the Netherlands! I’m surprised I didn’t hear about this earlier. Takes an incrementalist approach towards meat-eating, mimicing Al Gore’s Powerpoint-style presentation in An Inconvenient Truth. Shows how one meatless day of the week helps. A holistic, innocent, earthy, video blogger who gently lays out the stats and gives some nice homemade graphics :). Her summary: “Surprising solution beyond CFL lightbulbs, planting trees, & hybrids”. Check out Rachel’s website at www.rachelavalon.com. She is trained in holistic nutrition, reflexology and massage therapy! As Google reveals, this is one of the most viral videos on meat and global warming out there. But be careful with this one. For those who don’t know, Glen Beck is a prominent right-wing talk show host, who thinks the global warming crowd is alarmist and being misled. It seems that his goal is to manipulate the subject of meat and global warming, as an “all or nothing” sort of issue – in order to further antagonize the skeptics, or to even divide global warming activists. This is my hunch at least. Beck never mentions the fact that one could simply eat LESS meat, though the PETA organizer does mention it at the end. Beck even prepared a video catching well-known celebrities and of course, Al Gore, eating meat. Eat ANY meat? Guilt! Guilt! Shame! Shame! However, it is nonetheless an informative video that brought attention to this issue, and includes some points I can agree with. Gore should bring up the impact of livestock on global warming. I just hope people aren’t introduced to this subject through Beck. This guy is great. Non-vegetarian and author who blogs at the NY Times about cooking, with occasional blog posts on the impact of meat on global warming. The video explains how industrial agricultural is to blame for our diets and for harming the Earth. One of many videos from Supreme Master Ching Hai, on meat and global warming. You may not agree with all of her spiritual views, but you can agree that she is channeling her energy for the planet. “Supreme Master TV” is a multilingual video channel which regularly emphasizes why and how to go vegetarian and vegan. It’s very interesting to watch Obama’s respond to this question on the environmental impact of our diet. He explains that as a result of climate change and livestock production, the global food system is under immense stress – and says rising global meat consumption is a threat. He gives some tangible examples. He also ties the question to health, noting that the US healthcare system could save a trillion dollars if obesity levels were lowered to 1980 levels. YESiree. Of course, he says all this in a much more articulate and non-threatening sort of way. Yay, this is the president of the USA speaking! The question – Nikki Benoit: Thank you, Senator, very much for your strong environmental position. The United Nations actually has reiterated that factory farming is contributing more to global greenhouse gas emissions than all of transportation. I think that as a global community we really need to be the leader and moving more towards non-factory farming animal agriculture. It’s very egregious. There’s 10 billion land animals that we are funneling our precious water and grain through when 70 per cent of all of our grain could help feed the world’s hungry. So, as the next leader of the most amazing nation in the world, how can we set the example on the more nutritional, plant-based diet that’s more eco-friendly and sustainable, that can maintain our water resources and all of our grain. Thank you very much. The reporter, Alina Cho, talks about the facts while showing off some vegan food in action. She concludes by telling viewers that she is not saying one has to cut meat entirely out of his/her diet to make a significant impact (despite the story on veganism). Unfortunately, the video quality is not great. This is a useful post for illustrating meat’s carbon footprint to different people. Do you like exotic food? Know a Prius or SUV owner? Don’t plan on going veg anytime soon? There’s something for everyone. Hopefully, at least one of these ten studies will help you or someone you know to consider eating less meat. Steinfeld et all., United Nations, Food and Agricultural Organization, 2006. For those who just want to hear it from a “legitimate source”. Gidon Eshel and Martin, University of Chicago, December 2005. For the veg-curious and hybrid or SUV owners. Concluded switching from beef to kangaroo meat would significantly help fight global warming. To start conversations with exotic food lovers, cute Australians, global warming skeptics, and maybe animal rights activists. Christopher L. Weber and H. Scott Matthews, Department of Civil and Environmental Engineering and Department of Engineering and Public Policy, Carnegie Mellon Universit(April 2008). For locavores and the “just buy local or organic” discussions. A look at the individual carbon footprints of beef, pork, chicken and fish. Beef accounts for only 30% of all meat consumption, but contributes 78% of meat’s greenhouse gas emissions. AFP summary: Hamburgers are the Hummers of Food in Global Warming. American Association for the Advancement of Science annual meeting, Chicago (Feb. 15). For the everyday meat eater. Concludes: “The greenhouse gas emissions arising every year from the production and consumption of cheeseburgers is roughly the amount emitted by 6.5 million to 19.6 million SUVs. There are now approximately 16 million SUVs currently on the road in the US. ” Total Cheeseburgers = Total SUVs? Jamais Cascio, ref: Energy Use in the Food Sector (PDF), a 2000 report from Stockholm University and the Swiss Federal Institute of Technology, (Dec. 2006). To help cheeseburger-eating, frequent SUV drivers feel even more guilty. Netherlands Environmental Assessment Agency, Earth System Science and Climate Change Group, Wageningen University Research Centre, February 2009. For any discussion about the dismal state of the world economy or stimulus packages. For those who give you links to carbon footprint calculators. Susan Subak, University College London (July 1999). This is an impressive study with maps and graphs on how cattle ranching is responsible for 80% of the continuous deforestation of the Amazon rainforest. According to Dr. Norman Myers, 5% of the world’s deforestation is currently due to cattle ranching. Overall deforestation is estimated to be responsible for 20% of all greenhouse gases, more than transportation. Summary: How Cattle Ranches are Chewing Up the Amazon Rainforest. For the everyday treehugger (a good thing) who isn’t cutting back on meat. For the next time your wife/husband/roommate/etc. complains about you leaving the lights on or wasting gas. New Scientist Magazine reports that researchers from the Netherlands have concluded that cutting back on meat could save $20 trillion off the cost of fighting global warming. According to the study (published Feb. 2009), if the world were to adopt a low-meat diet (defined as 70 grams of beef and 325 grams of chicken and eggs per week) there would be a 50% reduction in costs to stabilize carbon dioxide levels at 450 parts per million, a level that some scientists say is needed to help prevent dangerous droughts and sea level rises. A drop in livestock numbers which would significantly decrease methane levels and livestock feed levels ( to produce a kilogram of beef, or 2.2 pounds, farmers also have to feed a cow 15 kg of grain and 30 kg of forage). The availability of 15 million square kilometres of farmland which could be used instead for vegetation to absorb and reduce CO2 levels and to plant bioenergy crops to displace fossil fuels. This is huge news. $20 Trillion dollars is a lot of money (duh). But I think most of us would agree that it isn’t easy for people to switch to low-meat or no-meat diets. So why not take the time and resources to show people that such a diet is necessary? What if more people took the time to teach each other about how to adopt a low-meat diet? What if nonprofits, businesses, and governments invested in education programs (i.e., cooking classes, t.v. shows perhaps) to teach citizens about low-meat diets? Scientific American has put together 5 slides about the environmental costs of meat. This one in particular caught my eye. U.S. Environmental Protection Agency; Transportation Energy Data Book, U.S. Department of Energy, 2008; Seattle Food System Enhancement Project: Greenhouse Gas Emissions Study; Subak and Fiala references in "More to Explore"
It would take the equivalent of 57 lbs of potatoes to make the same amount of greenhouse gasses as 1 lb. of beef. That’s a lot of food that could be consumed by a lot of hungry people. The #1 human cause of deforestation in Latin America? Surprise…it’s the cattle industry. Why are rainforests important? First of all, rainforests help to slow global warming by significantly absorbing CO2 in our atmosphere. So as a result of deforestation, there is an increase in CO2 emissions. The rate of deforestation has increased significantly in the past few decades. Deforestation is now the #2 human cause of CO2, behind fossil fuels. Greenpeace is currently developing their campaign to pressure the Brazilian government to stop deforestation in the Amazon. Rainforests help us in many other priceless ways. We lose about 50,000 plant, animal and insect species a year due to deforestation. While 25% of Western pharmeceuticals are derived from rainforest ingredients, less than 1% of tropical plant species have been tested. The Amazon is described as the “Lungs of our Planet” because it provides more than 20 percent of the world’s oxygen, by continuously recycling carbon dioxide. Of the 3,000 plants that the U.S National cancer Institute has ID-ed as active against cancer cells, 70% are found in the rainforest. Experts agree that there is more economic value in leaving the rainforests intact than cutting it down for timber or the cattle industry. The rainforests, as you have read, provide immense value to humanity. But in a matter of decades, much of that value has been forever lost due to the cattle industry and the rising global appetite for meat.